Recently, the UK Daily Mail featured this article about a colorful insect experiment! You can also click on either of the first two photos to be taken to the article. Mohamed Babu is a scientist from South India. One day, his wife showed him some ants had turned white after drinking spilt milk. This gave him an idea! 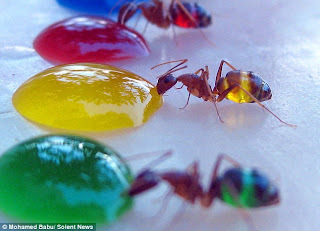 I can only imagine his glee when the ants abdomens began to turn the colors of the drops! 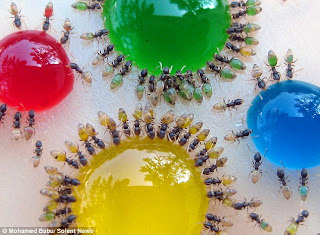 He noticed that the ants seemed to prefer the lighter colors - yellow & green - to the darker colors, red & blue. We've learned that all arthropods have a tough outer covering called an exoskeleton. However, we have also learned that some arthropods, such as "honey-pot" ants and ticks actually expand as they collect honey or blood in their body. Is the exoskeleton able to expand? Do these organisms have a different type of exoskeleton that other arthropods? I didn't know the answer so, as usual, I asked the UCSB ScienceLine (a GREAT resource for science teachers or other curious folks). You can still see the question since it is archived on the site. A couple of scientists explained how exoskeletons are actually made of hard plates joined by soft areas, much like the pads on a baseball catcher. When the honeypot ants do their thing, the soft parts stretch, but the hard parts stay the same size. The scientists point out that the exoskeleton is "now useless at protecting the ant, but the full ants just stay inside the nest where they are fairly safe." There are somewhere around 30 different species of honey pot ants, and they most often live on the edges of deserts in Western America, Mexico, Australia, South Africa and New Guinea. 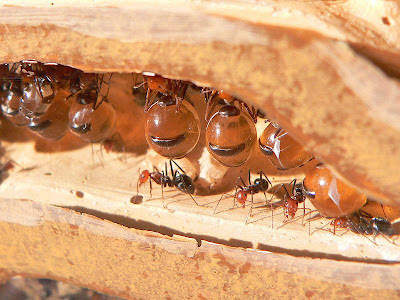 During the rainy season, particular worker ants (called repletes) drink up the liquid sugar from flowers until they are engorged. Then, during the dry season, they provide food for the rest of the colony by regurgitating a little bit at a time. You can see a great picture of a single ant here. Even NASA.gov has a blog post about these wonderful ants which includes a recording of a conversation with a scientist who knows a lot about ants - he is working on classifying all of the ants in the world! Just for kicks, here is a CC pic of some full honey pot ants! Welcome back to Celebrating Randomness! As many of you know, "This blog is intended mainly for my middle school students, but is gladly shared with all those who appreciate randomness in science and life." Seventeen months ago (when Blogger discontinued its ftp support and I had to restructure where and how my blog was published), I just quit. I was still finding random facts and interesting science, but these ideas were languishing in draft. If anyone is interested (or really, really, bored) here is a quick recap of 101 ideas that ended up in draft during this "blogging black hole." Whether or not they get developed into full-fledged posts remains to be seen, but I am moving forward in search of more randomness in the future.